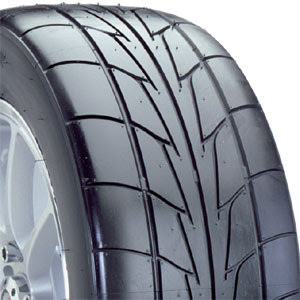 Nittos NT555R. The Worlds first 20 inch drag radial. They come in a 275/40/20(28.66 tall) and a 305/35/20(28.40 tall). The tires are a little taller than the stock run flats. The stock GT-R sizes are 255/40/20(28.03 tall) and 285/35/20(27.85 tall). They seem like they should work out as a set on a new GT-R. I liked the NT555R. I ran a set of them on my Typhoon, and later on my Syclone. They also work out 1/2 way ok on a road course. Well at least on the Typhoon and Syclone they worked out OK. Probably not enough sidewall for some people, and not stiff enough sidewall, but the grip provided by the tire kind of makes up for a little softer sidewall.